Clicker counters that sync to the cloud! 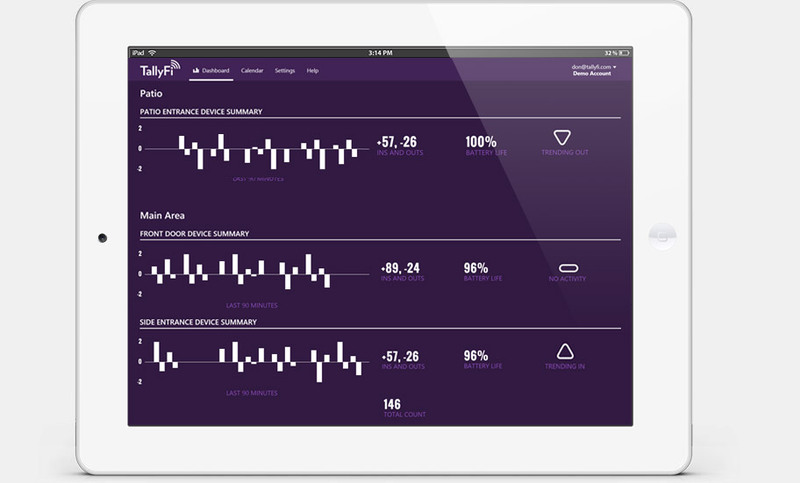 TallyFi is a simple counting solution that uploads every click to a live dashboard you can access from anywhere. 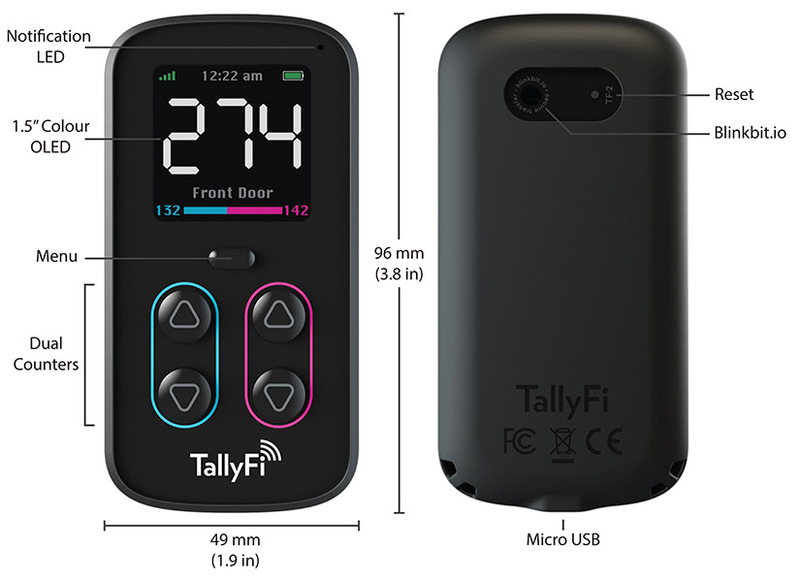 TallyFi counters are designed to mimic the simplicity of a mechanical tally counter, while unlocking the potential of real-time analytics. The simple, physical buttons make it easy to keep a precise count in any environment. 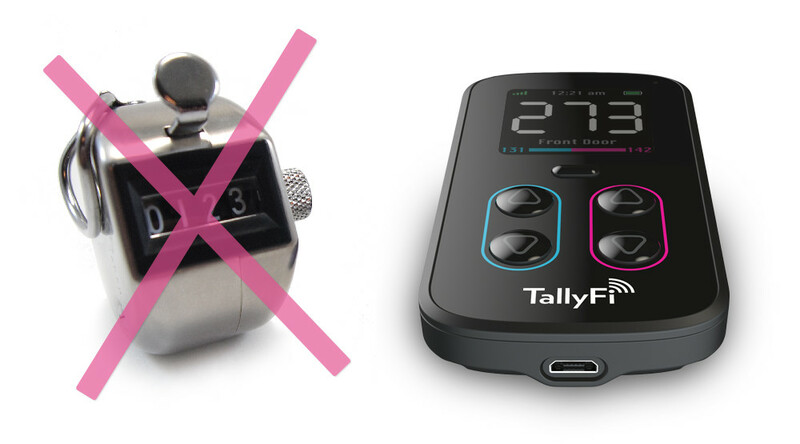 With separate buttons for adding and removing counts, plus multiple count channels, TallyFi counters offer a complete solution for all types of problems. Easily sync multiple TallyFi counters together to maintain a single accurate count, or use one of our advanced modes to handle your most complex requirements. Whether you’re at work, at home, or on the road you’ll always know exactly what’s happening. An accurate record of all the data you need is automatically uploaded, formatted, and available from TallyFi’s easy-to-use dashboard. From any smartphone, tablet, or computer all your information is available anytime, from anywhere. We’ll even deliver a weekly report direct to your inbox. 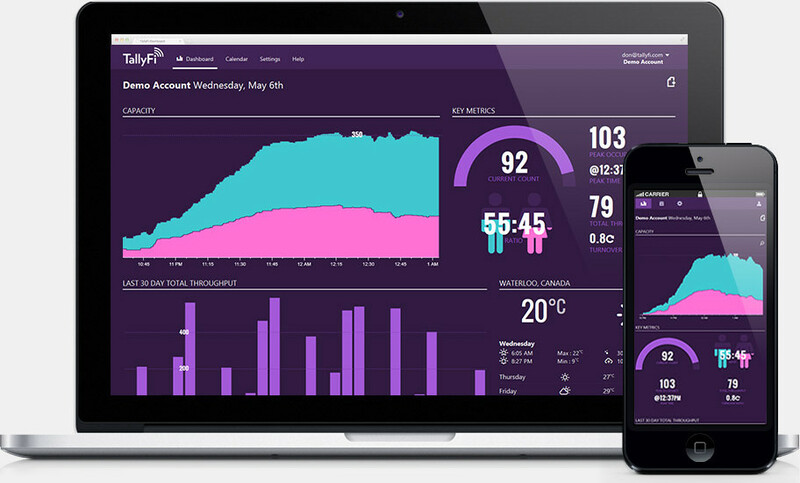 TallyFi’s real-time dashboard lets you watch the data as it happens. The current count, ratio, throughput, and peak times are all available at a glance. Make game time decisions, or monitor multiple counters from a single point of control. What's your venue? Solutions for everyone. Our synced counters and reporting tools are perfect for all types of venues and applications. Worried about rising staffing costs? TallyFi’s calendar reports let you easily optimize staff schedules. Trouble with fire code violations? TallyFi’s synced counters simplify any venue layout. Are your promotions really working? Accurate trend data and comparison tools will show you exactly what’s working, and what isn’t. Managing capacity, and understanding crowd dynamics is virtually impossible without a connected guest counting solution. TallyFi counters are an ideal solution for syncing count data across large venues with multiple points of entry. With a complete record of past events we’ll take the guess work out of the number of guests to expect, when to expect them, and how long they’ll stay. Measuring the attendance of exhibits is an important metric of success in museums and galleries. Realtime guest counts at every exhibit provides the ability to intelligently distribute guests within a museum or gallery. Setting a baseline and reviewing past performance is the best tool for continued improvement. Wait times remain a top issue at amusements parks, and queueing is consistently reported as the number one guest complaint. 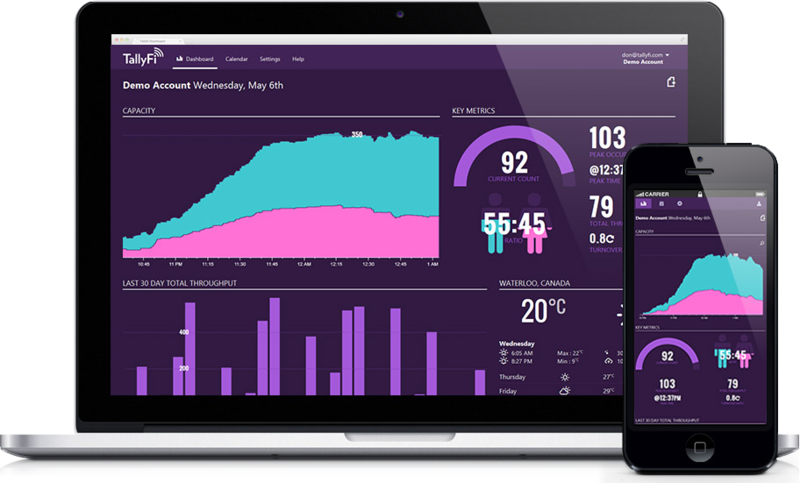 TallyFi simplifies logging and reporting accurate wait time and throughput data in real-time ensuring guests always have access to up-to-date information. Using the online dashboard and reporting tools, it’s easy to evaluate ride efficiency and track changes over time. Ready to order? Start counting today! The first step to success is understanding your business. Compare past events to measure your success and set goals with promoters. 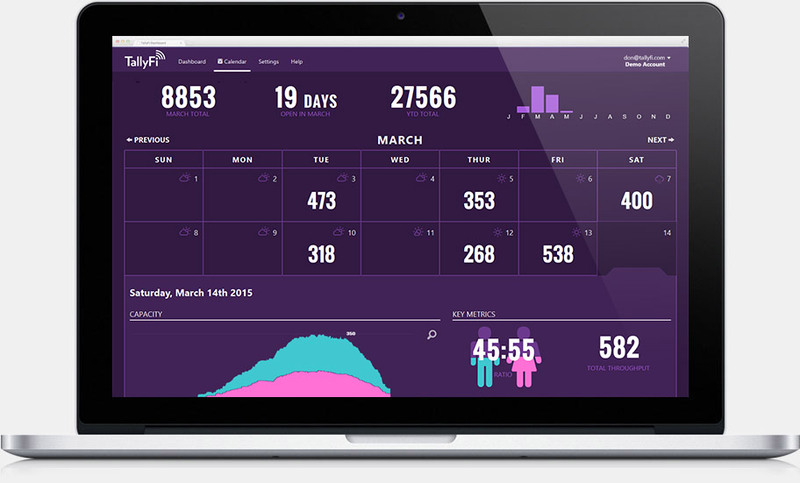 Rich data of every entrance and exit is logged in realtime to your dashboard. Use the dashboard on the go from your laptop or check in from your smartphone. All data is encrypted and stored privately on secure cloud servers based in North America. Analyze your entrances and exits over the course of an event with advanced charts and graphs. Log male and female attendees separately to identify trends or maintain an optimal balance. Automatically combine multiple counters together, to manage one space with multiple entrances. Want to learn more? Check out our FAQ. See what our customers have been asking about! Run events? Own multiple venues? Special pricing is available to meet your needs. Standard USB charging port. Built-in rechargeable lithium-ion battery. Leave us a message and we’ll get back to you shorty. Ask us anything!